The tears started falling weeks before the end of my maternity leave. Having a newborn is exhausting, between the sleepless nights, round-the-clock feedings and endless diaper changes. However, the joy of first smiles, the hours of snuggles and the wonder of early development also fill those first few months. As a working mom, the only time I had to spend at home with my girls was during maternity leave. Eliza, my oldest daughter, is 4. The first time I dropped her off at daycare I was devastated. Balancing meetings, new projects and now, the pumping and storage of breast milk, overwhelmed me. Over time, I discovered that being a working parent got easier. Though, it’s never truly easy. And now, I accept a certain amount of chaos as part of my daily life. With Vivian, my youngest and last baby, I knew that as much as I love my job, returning to work after leave would be one of the hardest things I’ve done as a mother. I knew those last few weeks of leave would be the last time I’d have to be with my baby all day, every day. And I mourned the end of this special time we had together. As a former journalist, I tend to deal with my emotions by arming myself with facts. And as a mom breastfeeding an infant, I had a lot of time to think. And Google. I started looking up articles about how to deal with the end of maternity leave and the transition back to work. These linked to other articles about the benefits of paid family leave. In addition, these babies are less likely to die within the first two years of life. I also learned that moms who have access to paid leave have a lower risk of postpartum anxiety and depression. And, for moms who breastfeed, they have a lower risk for breast cancer and diabetes later in life. I learned that fathers who have access to paid paternity leave remain more involved throughout their child’s life. And lastly, I learned that children whose fathers take paternity leave score higher on cognitive tests when they are older. 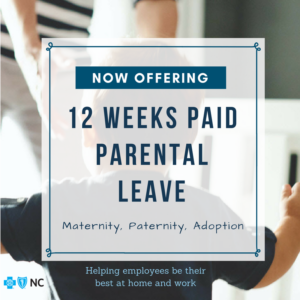 But despite these benefits, I learned that only 11 percent of Americans (and 11 percent of private-sector workers in North Carolina) have access to any paid family leave. Right now, the US is the only industrialized nation that does not guarantee paid leave after birth or adoption. A big part of my job at Blue Cross and Blue Shield of North Carolina (BCBSNC) is to work with nonprofits and community organizations on healthy living initiatives. I take our company’s mission to improve the health and well-being of our customers and communities very seriously. 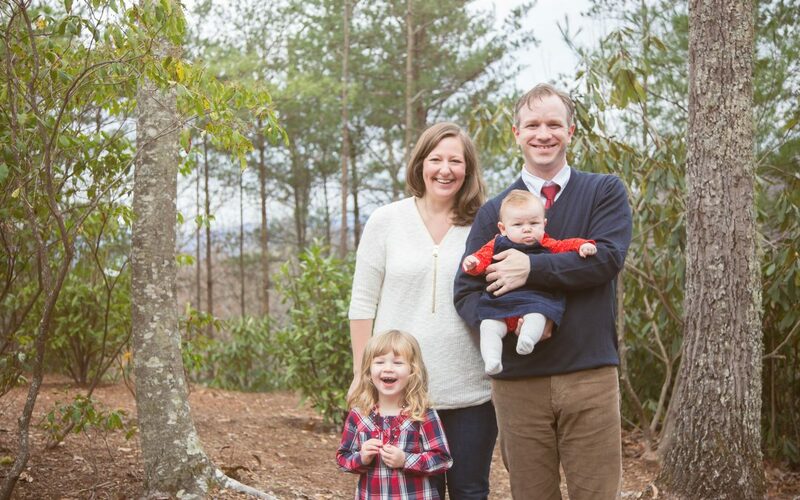 And as a mother, I could not sit by knowing that nine out of 10 private-sector working parents in North Carolina do not have what I believe should be a basic right: time to care for and bond with their child. BCBSNC is a company that cares about health and well-being of North Carolinians. It’s been a Working Mother top 100 company for 10 years running. It’s a company that already offers family-friendly benefits such as flexible work schedules, back-up, on-site childcare and paid time off. I had a mission. As the last few weeks of maternity leave became the last few days, I found myself mourning less and planning more. The week I returned, I met with my boss and pitched an idea. 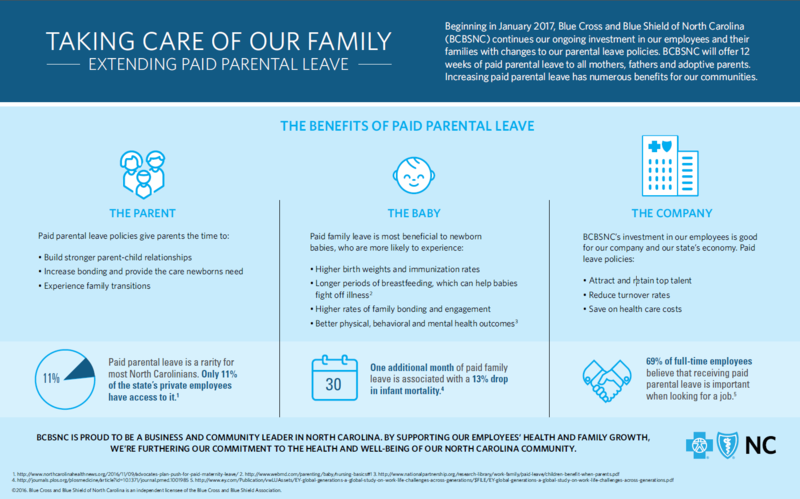 BCBSNC should expand its role as a leading employer to ensure that more team members have access to paid family leave, along with benefits that help mothers and fathers transition back to work after the birth or adoption of a child. The first, and perhaps most important, step is for the company to lead by example. To do this, we examined our own paid leave policy and made it as strong as it could be. And today, we’ve announced a change in this policy. Our new paid parental leave policy, starting next year, expands our current paid paternal leave policy to provide 12 weeks’ maternity, paternity and adoptive leave. This is a significant increase from the current eight weeks’ maternity, 2 weeks’ paternity and 4 weeks’ adoptive leave. It’s a strong policy that allows parents from all types of families the chance to be with their children at a crucial time in their children’s lives. And it’s a policy that will propel us forward as we continue our work to ensure that more North Carolinians have access to paid family leave and other benefits to make balancing work and family a little easier. Emily Swartzlander is a program manager in the BCBSNC corporate affairs department, where she creates and executes programs that support the health and well-being of the company’s customers and communities. Her career prior to BCBSNC focused on communications and nonprofit program management.